Proudly called the Beef Capital of Australia. Rockhampton has the statues of a bull at all gateways to the region. Rockhampton Airport is a major Australian regional airport that services the City of Rockhampton and Central Queensland, with flights to Brisbane, Mackay, Townsville, Cairns and the Gold Coast. 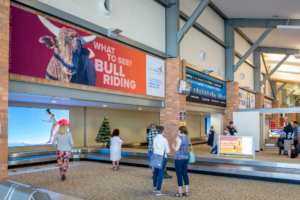 The Airport is located 5km from the Rockhampton city centre and has over 550,000 passengers passing through the terminal every year. Get in touch to learn more about Rockhampton Airport Advertising.